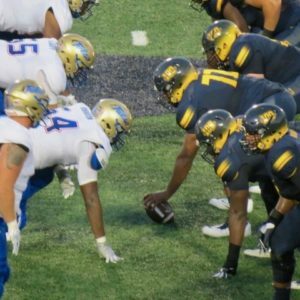 Toledo and Tulsa opened their playbooks to the “Defense Optional” chapter. 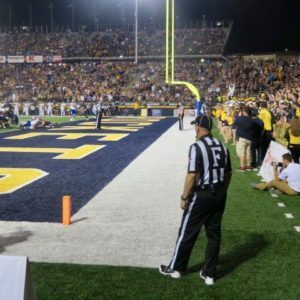 The consequential offensive torrent made for a thrilling game for casual fans, but a frustrating one for invested supporters – lots of groans hovered over The Glass Bowl on this Saturday night, but the final celebration belonged to the home fans. 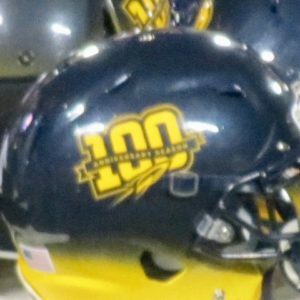 This season, Rocket football is celebrating 100 years of existence, and an impressive 2-0 start has it starting as memorably as it is historic. 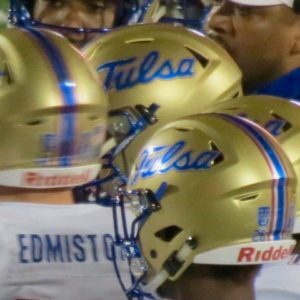 With the offensive minded Golden Hurricane blowing in, getting to 3-0 would require tenacity. 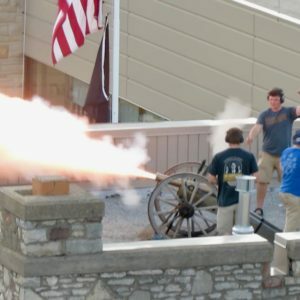 The Rockets were ready to launch. Campus was near silent as all the action flooded to The Glass Bowl. 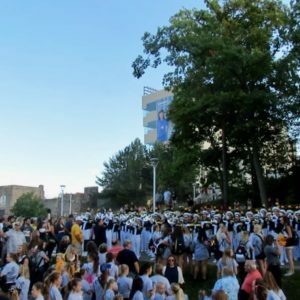 The area by University Hall fell silent with about an hour prior to kickoff. The only sound was that of the bell tower chiming six times. 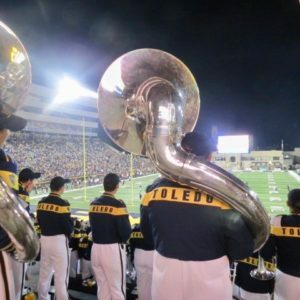 Approaching the stadium, Rocky and Rocksy paraded around as the Rocket Marching Band stopped at fan festivals and tailgates to jam the fight song. 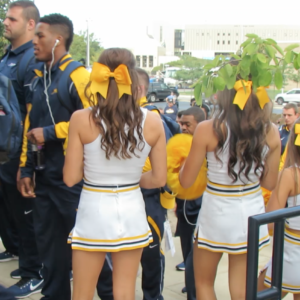 Both teams made their walk through toward the locker room with their respective fans on hand. 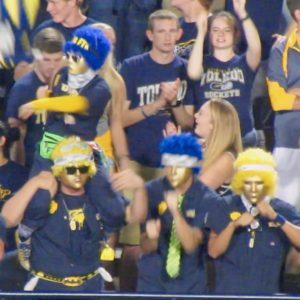 The Blue Crew, decked in their blue and yellow wigs, gold masks, and painter’s overalls skulked around the perimeter ready to animate Toledo spirit in their own unique way. The scene emoted festiveness. The stadium filled up quickly. 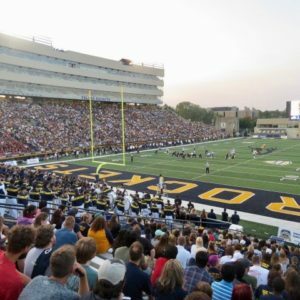 Packed with loyal Toledo followers, The Glass Bowl always becomes an outstanding venue. 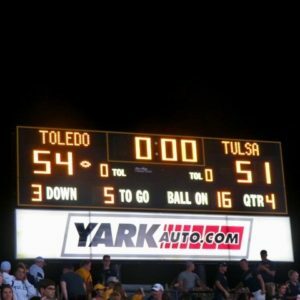 Tulsa jumped out to an early 28-7 lead, but the way both offenses moved the ball, a 21 point deficit was not out of reach. 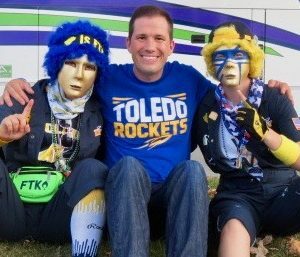 The second half brought forth a revived Rocket squad that rewarded the majority of fans that never gave up on their team. 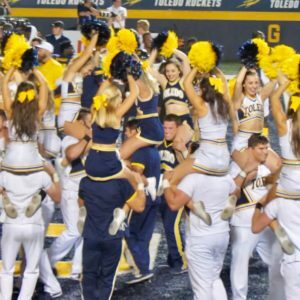 The game ended in a storybook type of fashion, with the score locked at 51 and 3 seconds on the clock with Toledo in position to win with a walk-off field goal. 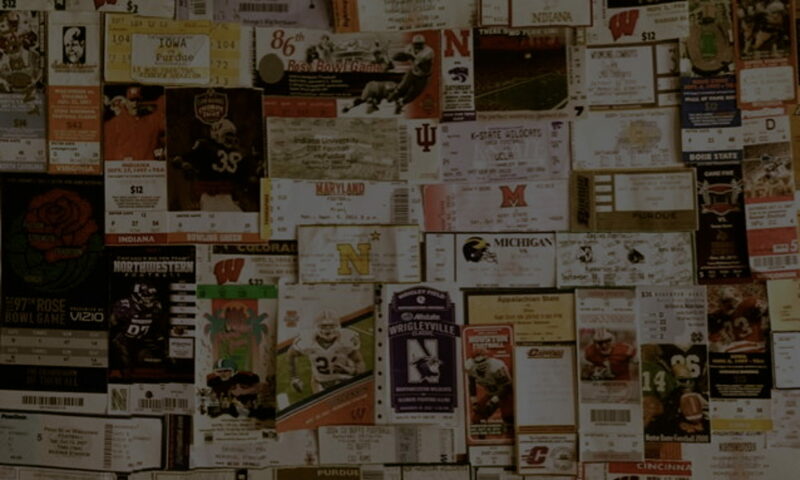 As the kick was set to attempt, the crowd dropped into sudden silence as though their volume was affected by a plug that was yanked out of the wall. 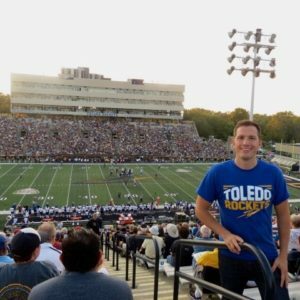 That electricity would be restored as the kick sailed through the uprights giving the Rockets a suspenseful and memorable victory fitting for their 100th anniversary. The party continued on the field and stands with the team, fans, and band. 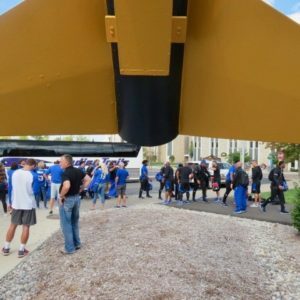 The excitement flowed out onto campus as the new season had become blissfully blessed with an unblemished beginning.